Cleveland sports fans are grasping at straws. They’ve spent the past year hearing LeBron James was sure to depart again, and now the narrative is hitting full steam as we’re mere hours away from his contract opt-in deadline with the Cleveland Cavaliers. Los Angeles remains the destination everyone is sure James is heading to. But wait, Cavs fans may say, he can’t leave. Just look at what he wrote in his “I’m Coming Home” letter four years ago. Surely he wouldn’t make those promises to stay in Cleveland for good only to leave four years later. I hate to break it to those clinging to this letter as a last-ditch hope for a positive outcome, but a lot has changed since James penned his emotional return to Northeast Ohio. Enough so that you can’t see it as any guarantee he’s staying put this summer. To be fair, when he announced his return in 2014, James hardly held back in making definitive statements about his intention to stay in Cleveland permanently. 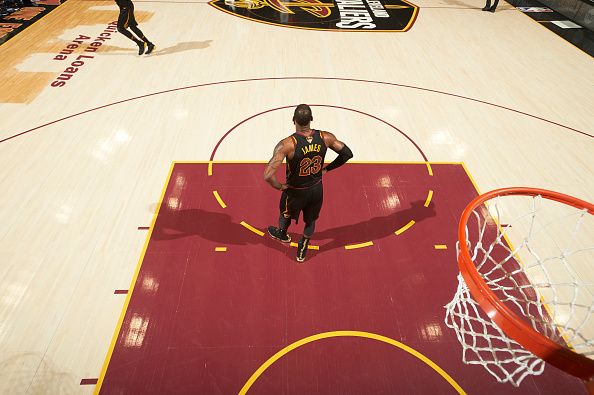 Quotes like “I always believed that I’d return to Cleveland and finish my career there” certainly make it seem like he had no desire to leave again. Claiming Cleveland was what made him happy, pointing out the fact his calling goes beyond basketball there, it all understandably has fans questioning why he’d seriously consider fleeing. However, you can poke holes in the idea he’s going to stick to his word when it comes time to make his free agency decision. First, those who think James wouldn’t double back on these statements seem to forget his 2010 departure to Miami occurred not long after he claimed his one goal was to bring a championship to Cleveland. This alone proves he’s not someone who’s going to hold himself accountable for any previous proclamations while considering his free agency options. On top of this, we’ve already seen James contradict some of the most important notes from his homecoming letter. When he returned, he discussed dropping his feud with Dan Gilbert, seemingly making peace with the angry statements the Cavs’ owner released when James left in 2010. “Who am I to hold a grudge,” he asked. Yet we’ve since seen plenty of evidence James is still irked by Gilbert’s actions eight years later. He’s made references to the letter more than a few times since rejoining the Cavs, clearly implying it’s still on his mind. Various reporters have noted the icy relationship he has with Cleveland’s owner, with some saying this is one of the main reasons he’s looking to find a new team. Those pointing to James’ stated desire to retire with the Cavs are also ignoring a key detail of his time since coming back. If he truly had every intention of playing out the rest of his career in Cleveland, why would he keep signing the one-and-done deals he’s been inking since he returned? Why not instead sign for a max contract? Why even leave the door open for another departure to begin with? One of the most important reasons why you shouldn’t see James’ letter as proof he’d never leave Cleveland is how much has changed since he wrote it. This letter was written before the Golden State Warriors turned into an insurmountable powerhouse, one which can only be toppled by another super team. It was written before Gilbert sent GM David Griffin packing, all despite the work he did assembling a championship roster and building a strong rapport with James. It was written before the Cavs traded the star point guard James called out by name when announcing his return, in a deal he openly asked the front office not to make. So, as easy as it may be to point to James’ letter as proof he’d never leave the Cavs again, too much has happened since to hold it as gospel truth. Mainly because, no matter what he ends up doing, you can’t argue he lied to everyone in his letter. He’s already accomplished what he set out to do in the first place.